Many companies adopt bonding for the exemption or late payments of Customs duty when importing or exporting raw materials and products, which allows flexibly utilizing funds to enhance competitiveness further in the international marketplace. ArgoTX is the management system designed for enterprises establishing bonded warehouses and factories in Taiwan bonded areas. 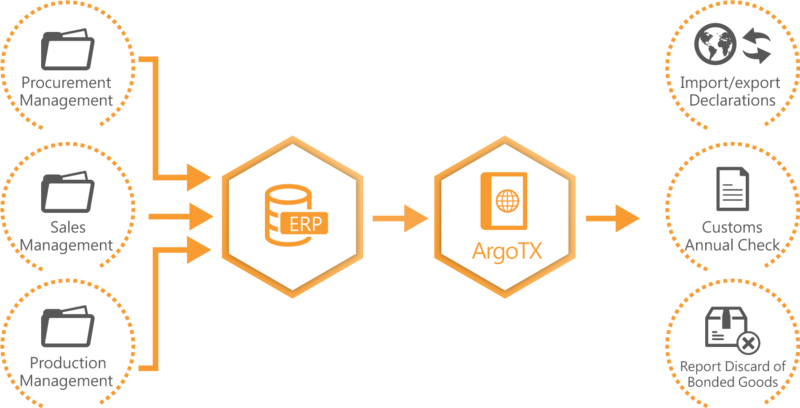 As a result, ArgoTX, also linked with ERP and generating multi-version BOMs, would be the best assistant for integration of different financial settlement reports. ERP data should be always synchronized with the changes of bonded/non-bonded goods transactions, inventory situations, and all information details. By updating data in time, the information about bonded material number products, BOMs, bonded goods import / export, outsourced processing, and material receiving would be clearly controlled to smoothly proceed for subsequent order receiving of business operations. Customs have to strictly oversee goods status in each bonded area to ensure duty payments are fulfilled. Therefore, even small mistakes in the annual check record for Customs and discard report for declarations could not happen. ArgoTX offers a checklist to help enterprises easily control all bonded goods current status. The annual financial settlement report, including information about raw material analysis, inventory, and materials, is an important indicator to which enterprises refer for whether there will be business direction change next year. Currency exchange sheets, summary sheets, and sheets of duty to be repaid for shrinkage are ArgoTX characteristics and the best helpers for adjustments in profit-and-loss statement.